What is a salt water generator? It’s a device that uses dissolved salt (2,500–6,000 ppm) as a storage for the chlorination system. A chlorine generator converts dissolved salt (NaCl) to the optimal amount of chlorine via electrolysis. A saltwater pool uses a chlorine generator (cell) to produce chlorine instead of the traditional method of adding it directly to your pool. A cholorine generator does indeed produce chlorine, alongside hypochlorous acid (HClO) and sodium hypochlorite (NaClO), but the water it produces has less salinity than a human teardrop. The difference in the quality of water is immense. A salt water generator produces water that is healthy and without harsh side effects that are often associated with chlorine pools — eliminating red eyes, dry skin and the odor of chlorine. It produces silky smooth water (yes, it’s true) and the salt water generator will monitor your pool chemistry for you. If that isn’t enough, you will save a lot of money in the long run. The three chlorinators covered in this article. Why Invest in a Salt Water Generator? Everyone with a swimming pool can agree it’s the greatest thing they own, and under no circumstances would they trade it in for anything else. At least not when we’re in the height of summer and the only thing getting you through the week is the thought of jumping into the pool and relaxing all weekend. There is also another big thing you’ll agree with, and it’s all to do with the dangerous chemicals you have to come into contact with in order to keep your swimming pool from turning into a wild swamp. Chlorine is absolutely essential if your pool is to remain free of microorganisms, but when you’ve got to deal with it on a regular basis it’s nice to imagine there could possibly be an easier way to keep your pool clean without buying any more. Fortunately for you there is, and all you need to do is turn your freshwater pool into a saltwater pool. If you haven’t yet filled your new pool up with water it’s even better, and saltwater is your ultimate choice. But first, let’s get one thing straight. What Is A Saltwater Swimming Pool? I feel this is the most important issue to address before we look into the finer details of salt water generators, because far too many people have got it completely wrong. Ask a hundred people how you end up with a saltwater pool and most of them will tell you a giant truck will come along and dump in water it’s collected from the sea. True ocean saltwater pools might still exist, but they’re old school and we’ve got a new way of doing things now. If you don’t dump sea water into a swimming pool, how on earth do you end up with a saltwater pool? You quite literally take the salt you would put on your food (making sure it was free of iodine) and sprinkle it into your pool. We’ll go over the specifics of how you do it later, but first we need to discuss what a salt water generator is and how it works. Do you remember the part where we said having to deal with chemicals was exhausting? 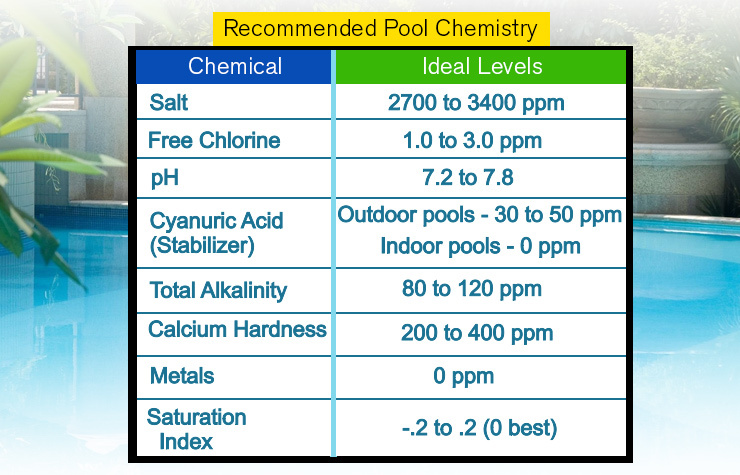 You still need chlorine inside your pool, but a salt water generator will produce it. You’ll turn into a swimming pool Willy Wonka producing chlorine in your own little factory in your back garden. Dump salt inside your pool and it will go through the electrolytic cell inside the salt water generator. Through a process of electrolysis, which involves the use of a small electrical current, the water is broken down into its basic elements and chlorine is produced. I might have led you into believing you wouldn’t have to deal with chlorine any more, but I only said you wouldn’t have to buy any. Your pool will still be chlorinated, otherwise it would turn into a breeding ground for algae and bacteria, but you won’t have to handle the chlorine you would normally buy from the store. You won’t have to transport a dangerous chemical around, and you won’t have to store it inside your garden. Apart from the handling and storage of chlorine, there are a few other little advantages salt water generators will give you. A lovely new chlorine generator might cost you a few thousand dollars, or they can be cheaper depending on the size of your swimming pool. It sounds expensive until you realize they can last around 5 years if you look after them properly. If you’re not currently building a new swimming pool, you’ll have a good idea how much you spend on chlorine every year. You could spend a good few hundred dollars keeping your pool clean every year, and if you multiply that by the number of years a salt water generator will last you’ll see it will save you money. Saltwater sounds like a dirty word, and I can imagine you being able to taste the salt in your mouth as you read this. You have to understand you’ll get all the benefits of a chlorinated pool without feeling sick every time you open your mouth under the water. Did you know the salt level of the ocean is roughly 40,000 PPM (parts per million)? You can’t taste salt until it reaches around 5,000 PPM, but a saltwater pool might only need a salt level of 4,000 PPM to generate enough chlorine to keep it very clean. Let’s focus on the 4,000 PPM for a second, and we’ll also assume your swimming pool is brand new or it’s been completely drained. To reach the desired target, you would only need to pour 50 pounds of table salt into the pool for every 2,000 gallons of water. Pour it over the drain with the pump running and the salt will disperse around the pool within a day. If you already have a chlorinated pool when you buy a salt water generator, it’s almost as easy and to find out how much salt to add you’ll use salt strips to test the level your pool is currently sitting at. Use Pentair’s salinity calculator to determine how much salt you need to bring your pool to the ideal salinity of 3400 PPM. The chlorinator cell can be cleaned with a garden hose. If you’re sick and tired of maintaining your swimming pool, buying a salt water generator is the perfect solution. You will need to test the salt levels of your pool because it will drop due to something as minor as people climbing out with the salt stuck to their bodies, but in reality you’ll hardly need to top it up. Buy the right salt water generator and not only will it tell you the levels are low, but you’ll be told how much salt you need to add to hit 4,000 PPM again. There are some disadvantages to using salt water generators. They’re not going to turn you away from buying one, but there are a few important things you’ll be interested in hearing about. We’ll just spend a while looking at some of the best salt water generators first, because it will give your mind a chance to soak up all the benefits we’ve talked about so far. The first few will be focused on chlorine generators for in-ground pools, and we’ll cover above-ground pools at the end. Easy to check data like, salt levels, cell cleanliness, sanitizer output & water flow. The IntelliChlor salt water generator has an extensive list of features that you can read below. Adjustment is as easy as pressing two buttons. All performance data—production settings, hours of operation, chlorine output, cell cleaning cycles, salt readings and water temperature averages—are captured daily, making it easy to maintain perfect water. Exclusive cell use tracking feature communicates remaining hours of cell life in real-time. Integrated sensors in the cell ensure that water flow is sufficient for safe chlorine generation; under low water temperature conditions, automatic shut-off feature protects the unit and prolongs cell life. Titanium electrode cell blades are coated with Ruthenium oxide. Control electronics are isolated in the cell, away from high heat components, for longer cell life. Rugged, dependable power supply/transformer is UL. Approved and includes 15feet of UL Approved cable with easy installation via quick connector on power supply. The IntelliChlor chlorine generator meets important standards for safety. The power supply cell and electronics meet the requirements of the UL 1081 Standard—the industry standard for pool chlorine generators. The power supply itself is UL Approved with flammability rating UL 94VO. 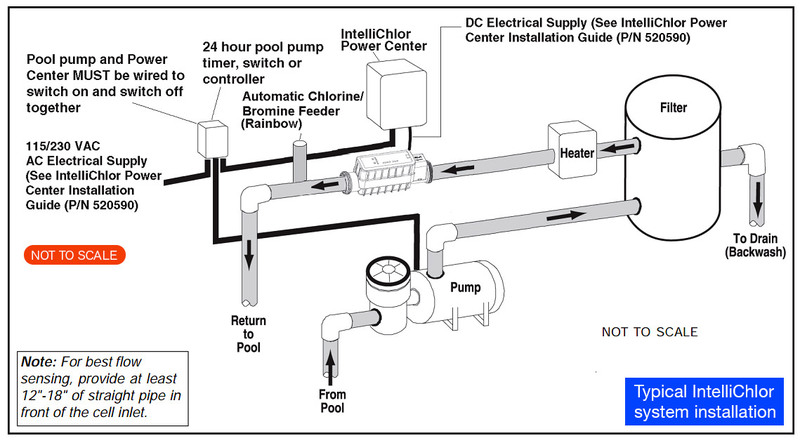 NOTE: The IntelliChlor chlorine cell requires the Pentair Power Center (520556), which converts AC electrical current to a low voltage DC current, required by the IntelliChlor electrolytic cell to operate and create chlorine for your swimming pool and spa.We discuss this in more detail later in the article. There are three specific models I’d like to discuss. They are all essentially the same except they’re engineered for different pool sizes and the IC20 can be used for either above-ground or inground pools. Produces up to .70 pounds of chlorine every 24 hours. Produces up to 1.40 pounds of chlorine every 24 hours. Produces up to 2.0 pounds of chlorine every 24 hours. — You should also be aware of the IntelliChlor IC15 (Model: 520888), which is specifically designed for above-ground swimming pools under 15,000 gallons. If you have an above-ground pool, get the IC15. View or download the MANUAL for the IC15. This model is only for above-ground pools. The only major difference between each model is the size of the generator cell. The IC40 is designed for pools with a capacity of up to 40,000 gallons, whereas the IC20 is only to be used on pools with a capacity of 20,000 gallons. The IC20 can be used on above-ground pools, but if you have an in-ground pool it will work out cheaper over the long term running the IC40 at a lower level. All the features we’ll now speak about come with either model. You hardly need to lift a finger when you own an IntelliChlor as they will do all of the work for you. You’ll know the amount of cell life left, plus it will give you the salt readings along with how much chlorine is being pumped into the swimming pool. It can even tell you when the cell should be cleaned, which can only increase its life as it won’t let you forget to do it. The built-in diagnostics will give you readings like the water temperature too. Click image to view large diagram. There are two specific things that make the IntelliChlor one of the easiest chlorine generators in the world to use. The displays are easy to read so you’ll have no excuse not to know what is going on, and the simple push-button operation makes it simple enough for anyone to use. Later on we’re going to talk about calcium build-up affecting salt water generators, but the IntelliChlor has on-time cycling to prevent it from happening so quickly. For pools up to 20,000 gallons. For above-ground or inground pools. 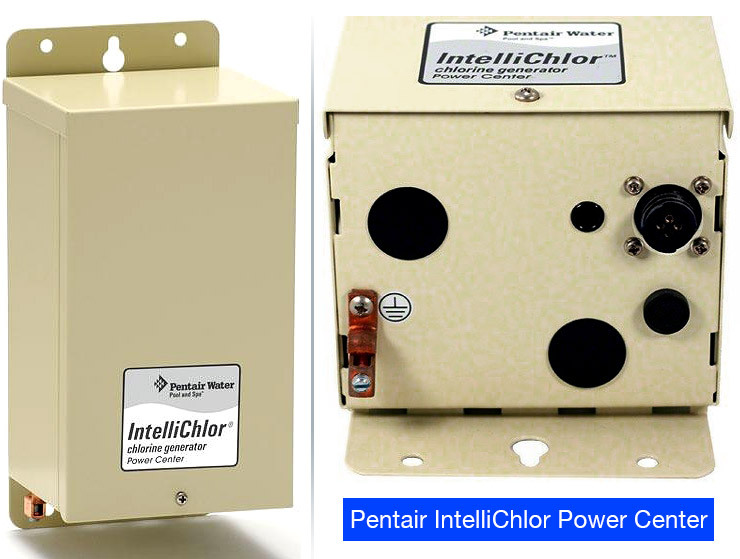 Pentair has a habit of building automatic shut-off systems into their products in order to preserve their life, and the IntelliChlor salt water generators are no different. They’ll shut off by themselves whenever they sense the water temperature has dropped too low. As an additional bonus, each model can also communicate with some of the other Pentair products you’ll be interested in purchasing. Easy-to-read displays tell you what to do and when to do it. switches the IECG off, and no chlorine is being produced. What’s this “dummy cell” for? After new pool construction has been completed, in order to prevent debris from entering the IntelliChlor Electronic Chlorine Generator, it is recommended that the IntelliChlor Electronic Chlorine Generator “dummy” cell (P/N 520588) be installed before installing the IntelliChlor Electronic Chlorine Generator. After the pool system has flushed the debris from the pipes, remove the “dummy cell” and install the IntelliChlor Electronic Chlorine Generator. NOTE: Standalone installations require a power center. The Power Center converts AC electrical current to a low voltage DC current required by the IntelliChlor electrolytic cell to operate and create chlorine for the swimming pool and spa. The Power Center must be installed more than 8 ft. (2.44 m) from the pool edges. Power Center is connected with the pool circulation pump electrical source so that the electrolytic cell only operates when the pool pump is on. For use with the Intellichlor salt chlorinator cell. Can be connected to an IntelliTouch, EasyTouch, and SunTouch system for automation control. Power Center enclosure can be mounted vertically on a flat surface such as a wall or post no more than 15 feet away from the cell controller. Please be aware, for standalone installations your IntelliChlor Salt Chlorine Generator will need this to provide it with power. Earlier on we talked about electrolysis, which is used to break down the basic elements, but in order for this to happen the IntelliChlor Power Center will need to convert the AC electrical current into a low voltage DC current. It will hook up to the pool circulation pump, which means your salt water generator will only switch on when your pool pump is operating. 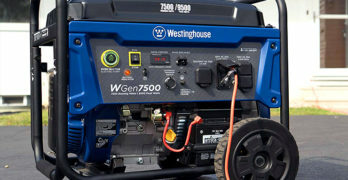 It’s another intelligent way to help the generator cell last longer. You can also connect it up to a number of different products for automation control, which will allow you to operate it remotely for even more convenience. View or download the INSTALLATION MANUAL for the Pentair Power Center. A great chlorinator from Hayward. Includes a control box and its TurboCell, an electrolytic converter that installs on your pool system’s return line, behind the pump, filter and heater. View or download the MANUAL for the AquaRite. View or download the BROCHURE for the AquaRite. The heart and soul of the AquaRite chlorination system. Just like the Pentair models, Hayward have also built advanced diagnostics into their AquaRite salt chlorine generating system. One of the most popular being the ability of the Hayward control to let you know when the T-cell needs cleaned out. As long as you keep the PH level (7.2-7.8) and calcium level (200-400 PPM) consistent, you should only need to clean it out around 3-4 times per year and it will extend its life. All in all, the diagnostics will provide you with 8 indicators letting you know what is going on with your AquaRite at all times. It has a microprocessor to automate all the functions, so even though you’ll be told if anything is wrong the unit will still be able to make necessary changes on its own. The digital salt display also lets you see the levels in the water in case you need to give it a quick top up. The control panel still lets you have full control of the amount of chlorine getting pumped into the water from zero all the way to one hundred percent. This includes allowing you to super chlorinate the water, which might be required in the event of heavy rainfall diluting the chlorine in your water. Make sure your pump is switched on and your pool will be super chlorinated for a full 24 hours until everything is back to normal again. Hayward plays on the fact the Aqua Rite is the most popular salt chlorine generating system in the world, which might possibly be true as it’s shifted a huge amount of units. They are also proud to offer you a 3-year warranty, which they claim is the best in the industry, but whether their claims are true or not you can still feel safe knowing you have nothing to lose by testing it out for yourself. The control panel is completely waterproof and all the connections are inside the door. The door can also be locked in the event of the weather taking a turn for the worst. Please be aware, even though the control panel can endure the harsh winters, the same can’t be said for your T-cell and everything connected to it. If you don’t drain the water away and it freezes up you could end up having to replace components before you’ll be able to pump chlorine into your pool again. When using a salt water generator it’s imperative that you only use sodium chloride (NaCl) salt that is greater than 99% pure. This is readily available food quality or water softener salt and can be purchased in 40-80 lb. bags labeled “Coarse Solar Salt.” You can also use water conditioning salt pellets, however, it will take longer for them to dissolve. Never use: Rock salt, salt with yellow prussiate of soda, salt with anti-caking additives, or iodized salt. A close-up of the control panel for the Aqua Rite. Power: When on, the Aqua Rite has power. Generating: This LED is constantly lit during normal operation. If the LED is flashing, the pool water is either too hot or cold for operation. Super Chlorinate: Illuminates during super-chlorination — which should be used when you have abnormally high number of people in the pool (especially kids), a large amount of rain, a cloudy water condition, or any other condition which needs a large amount of purification. Remotely Controlled: When illuminated, indicates that a remote pool automation control (Hayward/Goldline Pro Logic, Pentair Intellitouch, Polaris Eos, etc.) is controlling the AquaRite — the main switch and “Desired Output %” adjustment are inactive. When flashing, the Pro Logic, Intellitouch or Eos is in SERVICE or TIME-OUT mode and the Main Switch and “Desired Output %” adjustment are active. No Flow: When illuminated, the flow switch has detected no water flowing and the Aqua Rite has stopped making chlorine. A flashing LED tells you there’s a 15-60 second time delay period. Check Salt: Flashes when the salt level is low (below 2700 ppm) and AquaRite is generating at low efficiency. When illuminated steady, the salt level is too low and AquaRite has shut down. Before adding large quantities of salt, you should have your salt level checked by a professional. High Salt: When illuminated, the salt level is too high and AquaRite has shut down. Inspect Cell: A flashing LED indicates that either the cell efficiency is reduced or that it is time for regularly scheduled cell inspection. Inspect cell and clean if required. When illuminated steady, cell efficiency is drastically reduced and the Aqua Rite has stopped making chlorine. Inspect, clean or replace if necessary. Designed for above-ground pools under 15,000 gallons. Intex recommends using the 3000 GPH Krystal Clean Sand Filter Pump (28651EG) with the Krystal Clear Saltwater System. More info about this pump later in the article. View or download the MANUAL for the Intex 120V Krystal Clear Saltwater System. Intex specializes in salt water generators for above-ground swimming pools, and even though they’re not as advanced as the Pentair or Hayward products they are perfectly suited for your above-ground swimming pool. CG-28667 (up to 7,000 gallons) Krystal Clear Saltwater System with E.C.O. CG-28669 (up to 15,000 gallons) Krystal Clear Saltwater System with E.C.O. CG-28679 (2150 GPH) : (for pools 4,800 to 15,000 gallons) Krystal Clear Saltwater System & Sand Filter Pump with E.C.O. CG-28675 (1500 GPH) : (for pools 2,600 to 8,500 gallons) Krystal Clear Saltwater System & Sand Filter Pump with E.C.O. 28673EG (1050 GPH) : (for pools 2500 to 7000 gallons) Krystal Clear Saltwater System & Cartridge Filter Pump with E.C.O. *NOTE: E.C.O (Electrocatalytic Oxidation) : Is a method of purifying water via oxidation and reduction that eliminates and neutralize harmful substances. The Krystal Clear Saltwater System pumps out chlorine into the water like your standard salt water generator, but there is also a special system unique to Intex. It’s called an electrocatalytic oxidation process, and it has the power to split water molecules into extremely powerful oxidants. At first glance it doesn’t sound so special because it only helps to destroy bacteria and algae like every other chlorine generator, but there is a reason the process is unique. It will need to produce around 60 percent less chlorine in order to clean up your pool, and whenever you can reduce the amount of chlorine while keeping the pool clean it can only be a good thing. Also bear in mind, the CG-28667 requires a filter pump with a flow rate of 700-3,000 g/hr, and it produces 5 g/ph of chlorine. The CG-28669 requires one with a flow rate of 700-3,000 g/ph, and the amount of chlorine it produces is 12 g/Ph. For models CG-28667 and CG-28669, Intex recommends using the 3000 GPH Krystal Clean Sand Filter Pump (28651EG). Recommended to use with Intex Krystal Saltwater System. Specially designed for above ground pools. Six Functions : Filter, backwash, rinse, re-circulate, drain and close system. Includes tow 1.5″ (38 mm) connector hoses. Ideal for above ground pools 16′ and above. This pump requires virtually no maintenance except replacement of sand every 5 years. Includes: 6-way Valve. Pressure Gauge. Heavy Duty Tank. Strainer Basket. Built-in Timer. Powerful Motor (.95 HP). Intex is a great choice for those with an above-ground pool, but if you have an in-ground pool you need to be aware of something. When it comes to swimming pool appliances, Hayward and Pentair have almost become the same as Apple and Android in the computer operating system space. Everywhere you go, you’ll find people fighting over who produces the best appliances. Everyone is likely sticking up for the product they’re currently using. At the end of the day, they’re both massive companies and they’ve been around before you were born. They also happen to offer the most advanced appliances in the industry. So don’t decide which product to buy because of the name on the side of the control panel. Click through to the salt water generators offered by both brands and come to a final decision after weighing up all the small pros and cons then deciding what is right for you. I’m not actually sure if you would call these real disadvantages, simply because of the fact they’re a lot better than the alternative. At the very most they should probably be labeled minor inconveniences, and you will need to be aware of them. There is really just one that will affect you negatively, and it’s only if you have a certain type of swimming pool. Let’s get on with the show and you’ll soon find out what I mean. Every year you’ll need to service your salt water generator, but don’t worry because it’s a hundred times easier than you think. It’s simply a case of giving it a clean to keep it running smoothly. Your chlorine generator cell is where all the magic takes place, and you should take it out and run a small plastic brush through it. You’ll also want to get rid of any calcium deposits that have started to build up, which can be taken care of by mixing muriatic acid with water. If you do pour in too much salt, you’ll have to drain some of the water out and start again once you’ve tested it with salt strips. The actual amount of salt in the water won’t affect your health, so it’s nothing to be concerned with straight away. The worst thing it will do to your body is make you feel a little sick if you hate the taste of salt. In the long term it’s different, and too much salt will end up corroding metal things like your swimming pool ladders. Your chlorine generator cell should last about 10,000 hours, which is where we came up with the 5 year life earlier on in the article. The life of your cell will be affected by your pool capacity, the size of your cell, and various other demands of your pool. The only other thing to worry about is the life span of the cell getting shorter if you ask it to work harder. To maximize its life span, keep checking the water balance and make sure it remains at a healthy level as much as possible. When we looked at the different salt water generators you can buy, we spoke about choosing a model depending on the size of your swimming pool. To mess up at this stage would cost you a lot of money, so please make sure you buy one powerful enough to handle the water capacity of your swimming pool. You don’t want to find yourself swimming with little microorganisms because your salt water generator can’t produce enough chlorine to keep your pool nice and clean. This is without a doubt the biggest issue when it comes to chlorine generators, because apparently salt doesn’t play nice with concrete. The majority of professionals agree if you have a saltwater pool and it’s built with concrete you’ll have to resurface it a lot more often. I’m not trying to say resurfacing your pool will become a yearly event, but salt will have a noticeable affect on concrete even though it won’t make an ounce of difference in a fiberglass pool. If there is one inexpensive piece of equipment you’ll need to replace every once in a while it’s the pump seals. Just like seals in a lot of different things, they always seem to be the first thing to go. On the plus side, they’re easy to replace and it won’t hurt your bank balance. Once you fill your swimming pool with salt, they will wear out a little quicker than usual. It’s something to be aware of so you can check them more often. Do You Still Want A Salt Water Generator? All of these disadvantages were only to inform you of things to be aware of, but in no way can they ever come close to the advantages of owning a salt water generator. Your swimming pool needs to be clean at all times. Now you finally have the chance to accomplish it without messing around with an extremely dangerous chemical. The money and time you’ll save are nice too, but there is nothing better than producing your own chlorine with the help of some table salt.